Project submissions are between June 18, 2018 and August 31, 2018. IBM is the founding member of the $30 million, 5-year Call for Code Global Initiative. Created by David Clark of David Clark Cause, a renowned leader in cause-related initiatives working with iconic people and humanitarian organizations — and supports the United Nations Human Rights Office and the Red Cross. The Call for Code global initiative invites developers to create new applications aimed at reducing vulnerability by mitigating disaster risk. Hence, improving the overall resiliency of communities to rebuild health services in the wake of major disruptions. The winner will receive a cash prize, have access to long-term support through IBM’s partnership with the Linux Foundation, and the opportunity to quickly transition their solution into the real world. Both individuals and teams are welcome to participate. 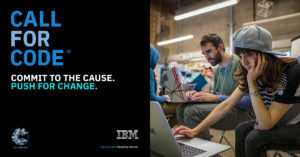 You can learn more about this opportunity at developer.ibm.com/callforcode.